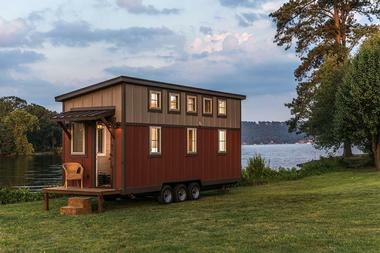 Tiny houses are taking over the country, and even the world. They are stylish, flexible and eco-friendly. 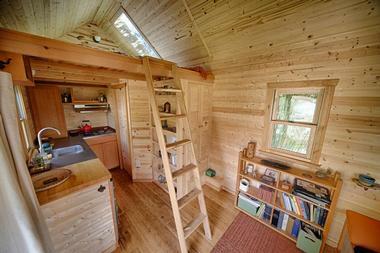 There is more to building tiny houses than just good craftsmanship. Many have innovative ideas and solutions for living small, and all have a great deal of artistic flair. Some are mobile, others are stationary, some are basic and simple while others are luxurious and stylish. And with the number of talented builders joining the movement, there is sure to be just the right tiny house for sale for you. The Perch & Nest team of experienced builders, designers, carpenters, licensed professionals, and up-cyclers have not only the skills but also a passion for simple living. They are themselves homeowners, homesteaders, and parents, and they work together to realize their client’s dreams of simple living in a smaller, more efficient space. 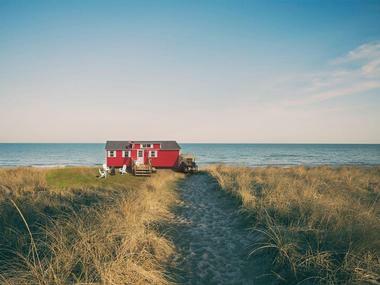 They create both small homes and small cottages, new or restored, on wheels and on land, using state-of-the art and reclaimed materials, following all the current building codes while keeping their client’s inspiration and dreams in mind. Being part of the tiny house movement allows them to really put their skills and fine craftsmanship into practice, producing little gems for their clients. They follow the credo of ‘less is more’, but this does not take anything away from the beauty of the final product and they always keep in mind that this will become someone’s home. The team at Liberation Tiny Homes believe everyone should have the chance to design and build the house of their dreams. They design and build custom tiny houses for people who do not want to live in cookie-cutter houses and who also want to leave their mark on their houses. 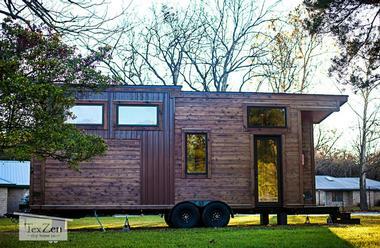 Their tiny custom houses are built on trailers that are custom built for each house by Elite Trailers from Arkansas. The houses come with a floor plan that is customizable, an A-frame or shed roof style, custom trailer, standard framing, foam insulation, pine, cedar, metal, vinyl or PVC siding, metal roof, electrical and plumbing system, composting toilet, on-demand water heater, cooktop, cabinetry, and laminate flooring. The rest is up to you. 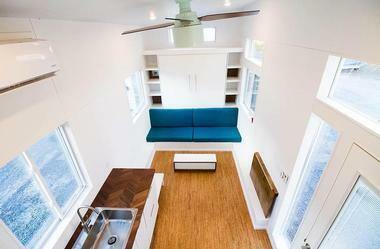 If you need a place to park your tiny home, the company has a connection to a tiny house community in Egg Harbor, New Jersey, on a lovely wooded property. The expression tiny house means different things for different people. 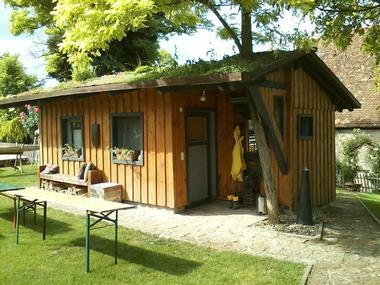 Sometimes, all that is needed is a tiny cottage surrounded by nature, away from it all. Creative Cottages is owned by designer and builder R. McAllister Lloyd, who has 30 years of experience designing custom cottages using environmentally appropriate building practices to create intimate, unique, and energy-efficient homes that are comfortable and linked to their surroundings. Each cottage combines the client’s needs and aesthetics with the builder’s knowledge of design, finely balancing function with a cozy, homey feel. The company offers their services for all parts of the process: from consulting to design to construction. They can help with advice and suggestions if a client has already started on their own small cottage, or they can care of the whole process, from the design to building to the delivery and installation of a pre-fabricated house. Matt Impola created his 250-square-foot tiny house on wheels as part of the Handcrafted Movement he founded in order to ‘play a part in the rebirth of American ingenuity and quality in manufacturing’. He is a builder, making regular houses during his working hours, and in his free time he built, almost completely from scratch, the house he calls the 'Artisan Retreat'. The house is the result of him combining his experience of learning about different cultures and design principles with his passion for the arts, craftsmanship, sustainability, and stewardship. The house, rustic but full of stylish and innovative details, is now for sale and hopefully Matt will be encouraged to make more of them. If you can imagine it, then father-and-son team Nick and Aaron Troisi promise to build it. 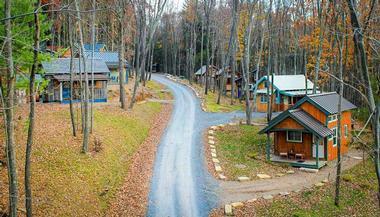 This team of builders, craftsmen, and artists do not have pre-designed plans or models for the tiny houses they build. Their passion is to work with quirky, creative clients and to design, build, or enhance their artistic, personal, and completely custom homes. Your house can be stationary or made on a trailer of 16 to 24 feet and comes according to the size, form, and shape you desire. 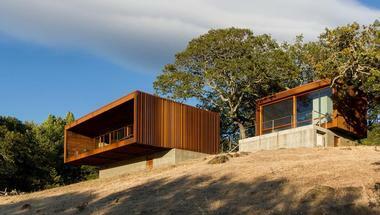 The only condition is that the house is very personal and meaningful for each client. They also work with clients who have made or are making their own tiny home and just need a few elements – a special door or window in an unusual shape, a counter, or a piece of furniture. They work directly and closely with clients to understand their wishes and dreams and help them make even their wildest ideas a reality. There are many reasons why people go for tiny houses, but behind them all are the need for freedom, sustainability, and security. Tiny Green Cabins is a builder of custom transportable, healthy, and sustainable tiny houses, cabins, micro homes, and camper cabins. They also sell tiny house kits and plans and provide design services for people who want to build their own tiny house. When you work with Tiny Green Cabins, you are closely involved in the design and building process and thus get exactly the house you want, and you can count on superior craftsmanship and a well-established reputation. They offer a large variety of styles, from fully assembled to do-it-yourself. Are you sure you want a tiny home? Do you know what is involved? How much stuff you will have to get rid of? These and so many questions need to be answered before you can even think of building your own unique tiny home that is adapted to your style. At Modern Tiny Living they offer that first step for free. About 15 minutes consultation with their engineer will tell you, and them, whether you should go ahead. 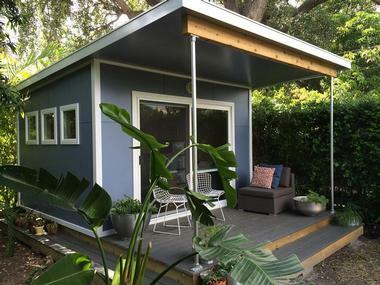 At Modern Tiny Living, they do not have models or pre-fabricated tiny homes. They do have basic concepts to help you decide which is the best setup for you. It could be the rough, value-conscious Base concept, the mobile Wonderer, for those who want to live off the grid, the Weekender, as an extra bedroom or studio in your backyard, or the Explorer, a truly mobile tiny home for those who want to sleep in a different location every month. 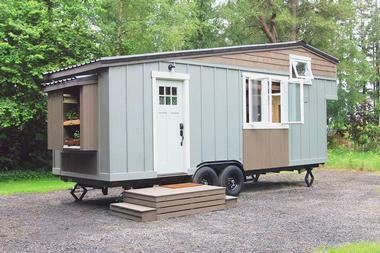 Timbercraft Tiny Homes do not have model tiny homes on wheels or plans you can buy. They are here to fulfil your dreams, to build that tiny home that is uniquely yours. They know that your dream of living simply and small was not built in one day and that you have been drawing plans, having ideas, collecting photos, and making lists of the things you need and those you do not. All they want to do is help you in that process. 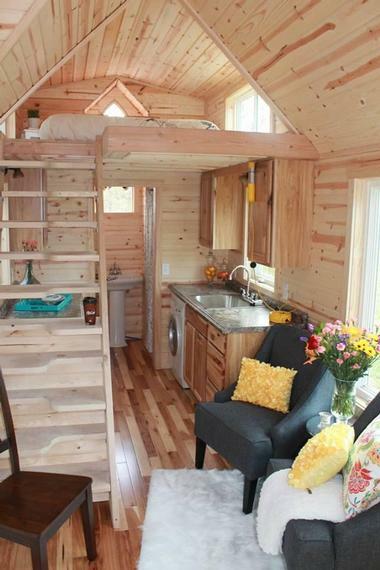 You can look at the beautiful photos of the tiny homes they have built for other people. You can have a look at the list of standard features they build into every home, and there is even a longer list of options you can dip into if you want or if you can afford them. The end result is not only a tiny house, but also a home that will take you along a new road in your life; a home that you will be as proud of as the team from Timbercraft are. Randy Jones produces his Incredible Tiny Homes in his not-so-tiny warehouse in Morristown, Tennessee. Nothing is given; everything from the size (16 to 40 feet) and materials to every last little detail are driven by the client’s instructions. Only one thing is sure – the client will receive superb craftsmanship and a high quality, wonderfully livable home. The process starts with the clients reviewing the standards that come with every tiny house and adding their wishes regarding the flooring, wall and siding material, number of lofts, type of bathroom, and so many other little details. The result is every client’s dream home, ready to hit the road or get parked in grandpa’s field. 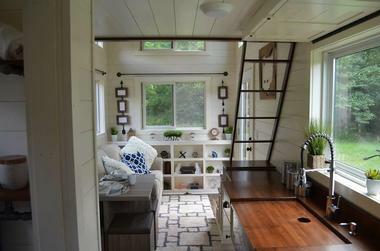 TexZen Tiny Home Company specializes in the design and construction of high quality tiny homes on wheels. Their Austin, Texas, team of experienced designers and carefully selected builders create each tiny home with careful attention to every detail, from a single nail to the choice of all the designer elements, showing a commitment to exceptional craftsmanship and the highest quality materials. Every step of the process is custom and is developed in conjunction with the client. Once the client shares all their ideas, needs, wishes, and budget, the TexZen team creates the blueprint and once the client accepts the plans, construction begins and soon the tiny house is ready to start on its journey as a mobile home for someone who is as passionate about tiny living as the team at TexZen. 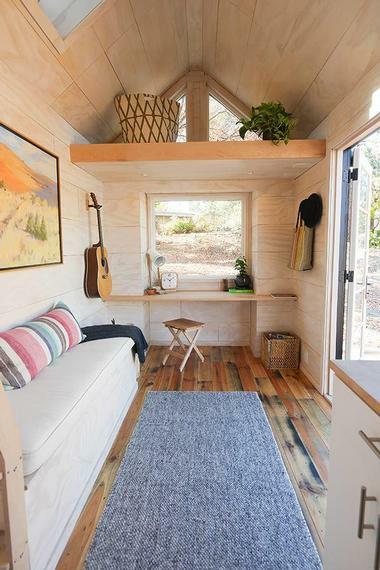 Mike Bedsole spent his life remodeling and repairing houses big and small, but the tiny house trend triggered his inner creativity and his wish to build something exciting and fun, something out of the box. The result is his Tiny House Chattanooga, the company that creates tiny, innovative houses on wheels, converting their clients’ dreams of living a simpler life in a tiny house into a real, livable reality. The client specifies what they have in mind, what style, size, or material as well as all the other details, and he does the rest. While they normally complete the house, making it move-in ready, they can also create just a ‘shell’ if the client wants to engage their own creativity and DIY skills and do the interior work themselves. 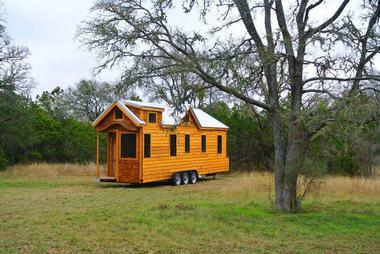 Their partner company produces custom trailers for each tiny house they make. Tongue & Groove Tiny Homes is based in Bend, Central Oregon, surrounded by high desert, rivers, and mountains. They responded to Bend’s lack of affordable housing and started building tiny houses on wheels, customized for each client’s needs and dreams. 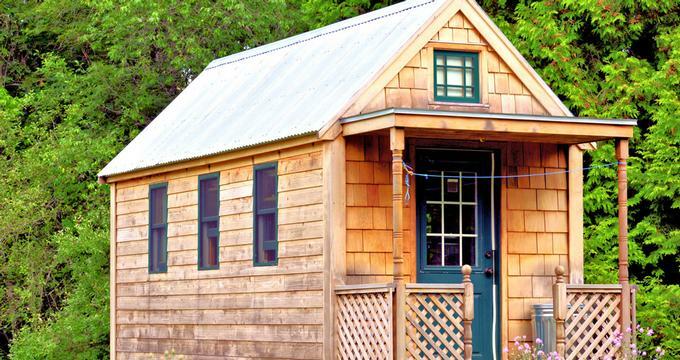 Besides tiny homes, they also build tiny custom structures and accessory dwellings and offer handyman’s services. If you are looking to build a tiny house, have a look at their Hiatus, the tiny house that started it all. You can look at the specifications and come up with your own version. They also sell and rent custom-made tiny houses – if you need a tiny tavern for your next party, have a look at one theirs, which even comes with a ping-pong table. 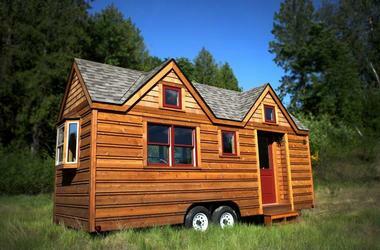 At Rocky Mountain Tiny Houses they design and build completely customized high quality tiny houses on wheels. They live and work in the spectacular San Juan Mountains of Colorado and understand what people who live surrounded by mountains need and want. Each tiny home is comfortable, custom designed and built and offers interesting and creative solutions as well as incredible value for money. Clients start the process by sharing their needs and wishes, such as width, length, shed roof, gable or something else, bumper pull or gooseneck, and budget. If you are not sure about some things, the team is there to help. And do not worry if your dream house seems somewhat outrageous, many of their concepts already push the boundary of what is possible. You can also look at the photos of the 35 houses they have already built to get some ideas, or you can buy one of their plans and do the whole thing with your own hands. Cabin Fever is a manufacturer of pre-fabricated structures that has the goal of creating compact, simple, and efficient building solutions for commercial and residential use. They produce these structures at their facility and then ship them in sections to the building site to be assembled by the owners or their hired contractors. Their highly customizable Maxwell cabins can be created in any size and can easily be put together in whichever configuration the client wants. They also create completely custom structures according to the client’s requests as well as upgrades to existing living spaces. The Cabin Fever team guides their clients through the engineering, manufacturing, and permitting process and sends the pre-fabricated homes with detailed instructions for assembly. Artist Craig Pleasants was way ahead of the tiny housing trend. He designed and built his first tiny house, called the Octagonal Living Unit, in 1981 using salvaged and found materials and lived in it for three years. The house, which is as much a piece of art as it is a home, stirred great interest, so Craig developed an affordable kit for a 450-square-foot highly energy-efficient house that four people can put together in a day. The kit consists of the pre-finished high tech insulated panels for the roof as well as the walls, roof beams, siding material, low-energy doors and windows, roofing material, and the fasteners necessary to put the house together. There is no waste – everything is pre-cut and fits together perfectly. As it has been designed by an artist, the house is beautiful both inside and out, full of light, and appears much larger due to both the lack of 90-degree corners and the cathedral ceiling in one half of the house. While most of Alchemy’s business is traditional architectural design services, they are internationally known for their design of the weeHouse, a pre-fabricated option for houses, cabins, offices, rooftop studios, and even multi-unit developments. Each weeHouse is custom built to the client’s specific site and budget. What makes weeHouses unique is their close, collaborative work with clients, partnership with fabricators and builders, and playful approach to architecture. WeeHouses are based on contemporary aesthetics, environmental stewardship, and the smart adaptation of the pre-fabricated building system. While they come in different sizes, they all have modern kitchens, deluxe finishing, unique siding, and the opportunity for a green energy upgrade. Portland Alternative Dwellings is a Portland company that educates and offers advice and resources in order to make tiny houses a reality for those who dream of living small. It all started in 2004, when Dee Williams built a tiny 84-square-foot house with her own hands and realized that it is not about having less, but rather about having more – time and money – to do the things that are really important. 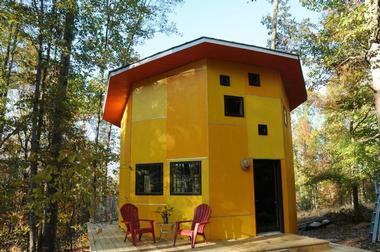 PAD offers highly affordable plans for a number of very diverse tiny houses. Some plans are simple, while others include photos to help people build some of the more challenging aspects of the design. Other resources include helpful books on house building in general as well as on the specific challenges of building small. There are also names of reputable builders and manufacturers in the Pacific Northwest. Seattle Tiny Homes promises to help you realize your dream of having a tiny home on wheels that is uniquely yours, because the way you live is different from anyone else’s. They offer their clients a range of options. They have model tiny homes you can choose from or use as a model to customize and adapt to your needs. With their starter home option, they start the construction based on your requirements and then you get to use your creativity and skills to finish it. They can also make you a trailer that is specifically built for the tiny house you are building. And if all you want is a design and a consultation about a project you want to start yourself, Seattle Tiny Homes are there for you. Hobbitat Spaces has a passion for small houses that are carefully designed to utilize modern technology that is wrapped in repurposed and reclaimed materials. They create spaces that inspire simple living and are energy efficient and healthy. They are as unique as each client and adapt to each client’s way of life. At Hobbitat Spaces, they create Hobs, small turn-key houses that range from 225 to 750 square feet in several different styles and layouts. They all have everything a large house has – a full kitchen and bath, a bedroom on the main level, and a loft. 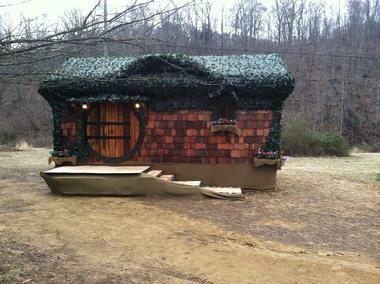 If you like to customize your small house yourself, you can get Hobbitat’s ‘follies’, tiny house shells that range from 11 to 24 feet in length. They are made of single-board walls, a metal roof, exposed framing, reclaimed doors and windows, recycled wood floors, and basic wiring. 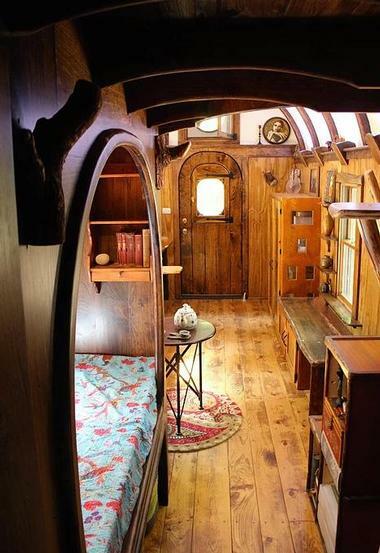 You can also purchase plans for one of the several small or tiny houses Hobbitat has created. Located in Spruce Pine, NC, folks at Buck’s Tiny Houses make tiny houses for your big life and they make them as unique as you are. They start with four beautiful base models and if you do not fall in love in any of these, you can customize to your heart’s content or get them to design you a brand new one, totally yours. Customizing base models means choosing a paint color, black or white appliances, paint color for cabinets, shelves, furniture, hardware, and counters. These custom options will give your home the look and feel that you want. 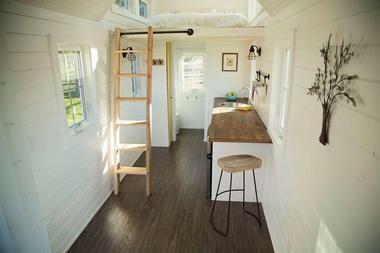 To create your custom tiny home from scratch, contact their design team and put them to work. 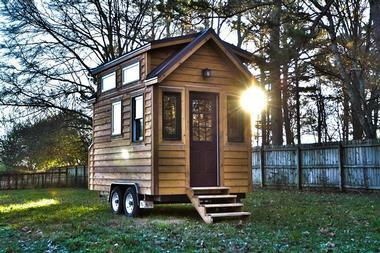 Buck’s Tiny Houses will ship your tiny home nationwide and offer financing. 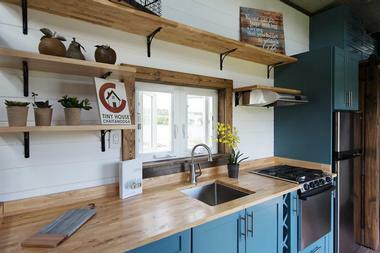 At Tiny House Northeast, they believe that tiny houses are not only cute, but also extremely environmentally friendly and require less resources to create, operate, and maintain. They also do not believe that tiny houses are simply a trend and so work to help reverse the damage done to the planet by making conservation a permanent thing. 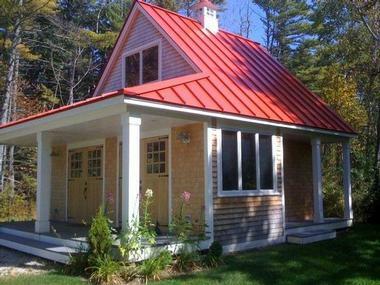 Tiny Houses Northeast offers tiny houses – home office or studio – on foundations or on wheels. They deliver your completed house to your site and there complete the interiors. Their Weelhouses are permanently set on heavy duty trailers. They work exclusively with clients from New England and upper New York because they know the climate and the materials required as well as the building codes. After 20 years of designing and building their widely acclaimed cottages, these builders decided to make them for everyone and came up with ESCAPE; as beautiful as the famous cottages, but affordable and portable. 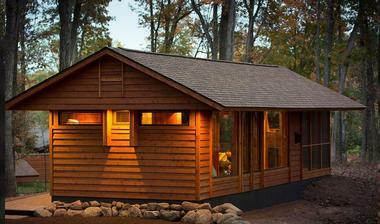 Designed by award-winning architects from SALA and hand-crafted in America in their factory in Rice Lake, Wisconsin, each ESCAPE is incredibly comfortable and built to last with a focus on eco-conscious building and energy efficiency. They are built using sustainable wood, the most energy-efficient windows, custom cabinets, full-sized stainless appliances, hardwood floors, and much more. ESCAPE is about making small spaces feel spacious and beautiful. They deliver almost anywhere in the States using their own trucking company. Each ESCAPE comes with an established floorplan and layout, but customers can decide what goes into the tiny home. By law, an ESCAPE is considered an RV, which makes its parking and financing easier than many other tiny homes. You want to live tiny? Want to build your own tiny home but don’t know how? Tiny Home Builders will start you on the right path with their construction guide to provide the basics, offer you videos on their step-by-step process, or invite you to attend their workshops, where you can gain real experience. They will provide you with all the tools, from plans to trailers on which to base your tiny home, or you can just let them deal with the whole process and ask them build it. You can get just a shell if you want to do your part and add your touches, or they can deliver a fully finished home ready for you to move in, whether it is a tiny house on wheels you can take anywhere or a backyard studio you want to place in your garden to use for painting or writing.